The Remnant Newspaper - Pope Sides With Left, Dumps Trump's "Basket of Deplorables"
Pope Sides With Left, Dumps Trump's "Basket of Deplorables"
Under Pope Francis, the church has abandoned many of its bedrock positions on issues like divorce and homosexuality in favor of a “why not?” attitude. Francis has scolded people for being rich, sided with illegal immigrants, and suggested the church should be a refuge for the poor. He has sidelined conservative cardinals, installed like-minded allies in key jobs, taken personal control of the Knights of Malta for defying him, and generally sent the signal that behind his amiable smile and humble talk lurks a radically liberal agenda. The latest example of the pope’s blueprint for the future is contained in an article penned by two of his closest confidantes. They believe that conservative Catholics in the United States have formed a coalition with Evangelical Protestants to push Donald Trump’s agenda, which the authors call a “Manichean vision.” The article, in the Jesuit publication La Civiltà Cattolica, could not have been printed without Francis’s knowledge and approval. The pope left little doubt about his feelings toward Trump when the president and first lady visited the Vatican earlier this year. 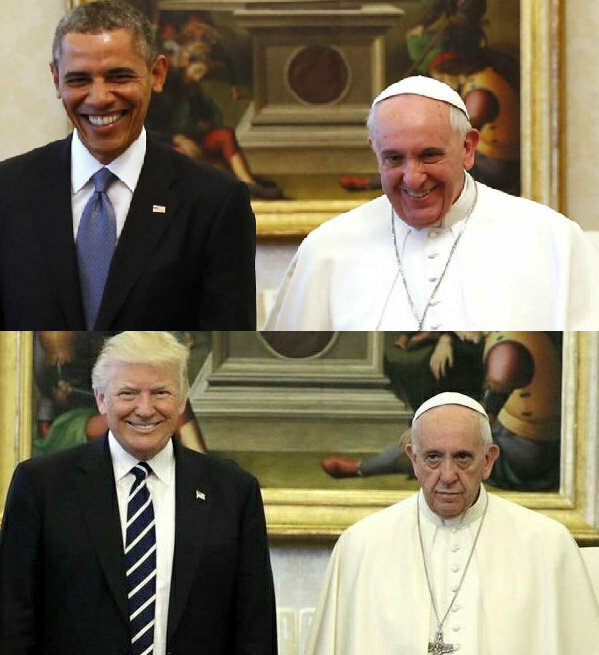 In their joint photo, Francis frowns as if he smelled something bad in the room. REMNANT COMMENT: Houston, we've got a problem! Let's be clear: This has little to do with Donald Trump the man. In fact, for the purposes of today’s Remnant Comment it makes little difference whether you like him, hate him, or are entirely indifferent to the man. For just a moment, let's climb out of the pigeonholes into which our handlers have consigned us and consider the bigger picture of what's really going on here. Trump was elected by a disenfranchised electorate of more or less pro-family, pro-life, pro-God Americans. Right? Can we all agree on that much? Voting for Donald Trump was an eleventh hour decision made by those of us who've had it up to here with the utopian dreams (and Orwellian nightmares) of a political elite hell-bent on destroying our way of life. We didn’t mistake the twice-divorced New York billionaire for one of us—as some daily communicant, ready to inspire the masses to rise up against the God-hating tyrants. The man still seems a bit stunned, in fact, by the world-wide and rabid opposition with which he's now confronted and which, let’s face it, he never saw coming. It's not as if he's some Garcia Moreno figure out there shouting allegiance to Christ the King on the White House lawn. And yet still they hate him. Why? Trump didn't start this fire—a fire which even the Vatican is now trying to extinguish. So, who did? Answer that correctly and you’ll understand why they hate him. What's left of a decent, God-fearing America started the fire, and since Trump has more money than God, and managed to find a way to win the Whitehouse sans blessing or permission from the phony-baloney two-party system, he's emerged as the de facto leader of the Basket of Deplorables. And this is why he finds himself in some pretty unlikely crosshairs. Everyone from the European Union, to the United Nations to the Vatican sees Trump as a man who needs to be eliminated. The conservative Never Trumpers should actually be grateful to Trump for, if nothing else, having ripped the mask off the farcical Republican "conservative" who’s been winning elections for decades just by unscrupulously exploiting pro-life America. That guy is just as much a Never Trumper as the rabid Leftist. In a general sense, Trump reminds me of Francois Athanase de Charette de la Contrie, the Royalist soldier and politician who rose to prominence in the Vendee during the French Revolution. With his mistresses and lax faith, Charette, like Trump, was no saint. Hiding beneath his bed, in fact, he had to be practically dragged into service by the Vendean peasants—regular, God-fearing folks in desperate need of a professional military man to lead them against the destroyers of their entire way of life who were enforcing “liberty” at the point of a gun. The longer Charette fought against the very Revolution he'd once defended in the New World as an officer in the Royal Navy, the more he came to recognize the abject evil his Catholic army (the original 'basket of deplorables') was up against. Once he'd seen through the slogans and phony rhetoric about Liberty, he realized there could be no compromise with the devils behind the mask. And while we have no idea where Trump's battle against the same resident evil will take him, it's interesting that Charette (the sinner) ended up dying a martyr's death rather than continue to bow to the Revolution that had grown to despise him once he'd agreed to fight for the regular, God-fearing folks. The parallel between the two men is far from perfect, admittedly. Charette was a Catholic, while Trump is far from it. But perhaps it will prompt us to pray for President Trump’s conversion, now that he too is experiencing the wrath of the Chirstophobes firsthand. But, again, it was the decent, family-loving, gun-toting, Bible-packing “deplorables” of western France (the heartland) who needed Charette—a man who knew the art of war—to lead them against the Anti-Christians of their day. Charette knew who the real enemy of the people was since he'd once been one of them. When he finally turned against them he became the hand of God. Will Trump unequivocally turn against his old friends in Washington and New York who’ve now come to hate him almost as much as they hate us? It’s a long shot, but we’ll have to wait and see. His only hope of success lies in his commitment to the “peasants” who put him where he is now. Even the Vatican is standing against him. And what I fear is that Pope Francis and his Leftist pals are targeting not Trump (not Charette) but us—the people, the peasants—who are refusing to sign on with the champions of Liberty and a Godless New World Order. The Hollywood left, demon Democrats, United Nations wackos, sustainable development megalomaniacs---they're all down with Pope Francis now. There's no conspiracy theorizing about it, as this news report from the secularist Fox News makes abundantly clear. The question is, what are we going to do now that it's clear—to our shock and disbelief—that our father in Rome has sided with them? Do we continue to play "let's pretend"? Or do we stand up, prayerfully, and resist him to his face even as Paul resisted Peter to his? It’s a horrific choice, admittedly, but it’s the only one we have. Francis doesn’t have to endorse Donald Trump. We get that. But for him to turn on the pro-life, pro-family, pro-God “basket of deplorables” who voted him in as a last-ditch defensive measure against the Anti-Christians, is, to say the least, telling indeed. Our neo-Catholic friends can stay in denial where Francis is concerned if they wish and as they see fit. We understand their fear of reading the terrible handwriting on the wall. We don't like what it says any more than they do, but that doesn't change the meaning of the words. Sooner or later, we're all going to have to make a choice: Do we remain Catholic, even if that means being more Catholic than the Pope, or do we apostatize along with everybody else? There is no other alternative. May God give us the courage (and the faith) to choose wisely.